It's no surprise that skin cancer is a public health problem, particularly in sunnier areas of the world. In the United States, the rate of nonmelanoma skin cancer has been on the rise. Almost everyone has had a bad sunburn or two in their lives, especially when taking a vacation to a beach or to a destination with a tropical climate. What some people with inflammatory bowel disease (IBD) might not know, however, is that they are at an increased risk of developing skin cancer simply because they have IBD. The good news is that we know about the risk, which means much can be done to avoid being exposed to too much sun. Don't stay home and avoid travel or fun activities because of the sun! Sunscreens are a great way to limit exposure, but for those that don't like to use them, there is UV-blocking clothing available in a wide variety of styles. Hats and umbrellas or even going into the shade are also helpful. Taking a few minutes every day to think about ultraviolet (UV) protection will go a long way to preventing future issues. Most people who develop skin cancer will be able to get treatment and avoid serious complications, especially if it is found early. People with IBD, and especially those with Crohn's disease, are at an increased risk of developing skin cancer (melanoma and nonmelanoma). One large meta-analysis showed the risk may be as high as 37 percent. That does sound alarming, but limiting sun exposure is a great way to reduce this risk, and it is something that is under your direct control. Keeping sunscreen in your IBD kit and investing in some UV-blocking clothing are great ways to avoid the sun. Another concern with increased risk is how medications used to treat IBD come into play. It's been shown that taking drugs in the classes called thiopurines (such as Imuran and Purinethol) can increase the chances of having nonmelanoma skin cancer in people with IBD. For medications known as biologics (Remicade, Entyvio, Humira), studies have shown an increase in the risk of melanoma. If you're taking one of those medications, you may be concerned about the cancer risk, but it needs to be compared against the risk of letting inflammation from IBD go unchecked and cause serious complications both in the intestines and outside the intestines. Talk to your gastroenterologist about your overall risks and how to put everything in perspective. A dermatologist can also help and give suggestions on how to avoid sun exposure and how to determine your individual risk. 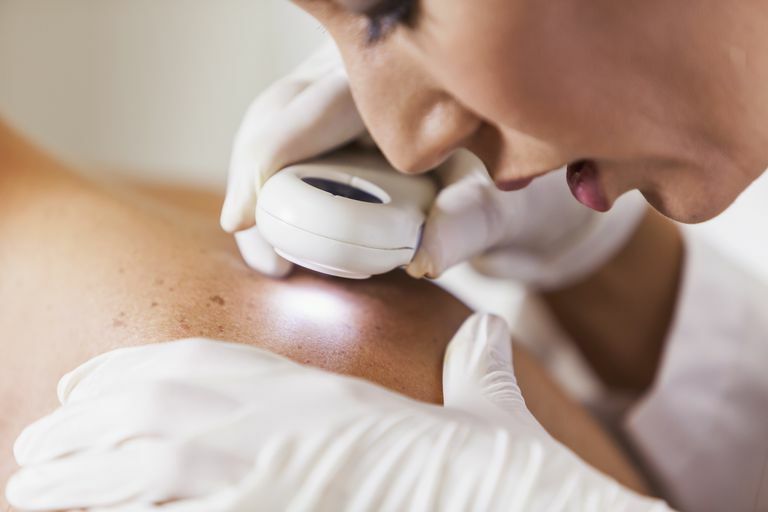 How Often Should You Get Checked for Skin Cancer? People with IBD should typically get screened for skin cancer once a year. In some cases, for people who are thought to be at a greater risk, more frequent screening might be recommended. One study showed that when people with Crohn's disease were screened once a year, it was the most cost-effective in terms of catching skin cancer early and treating it. People with IBD should ask their physicians about the importance of screening for skin cancer and how often it should be done. Because of the risk of skin cancer for people with IBD, prevention is important. Fortunately, there are ways to work sun protection into any schedule or lifestyle. Here are some ways you can avoid being exposed to too much sun. Sunscreens. Obviously the easiest and most widely available way to avoid sun exposure. Choose a high-quality brand that offers a high sun protective factor (SPF). It's not necessary to choose multiple types, but for those that need a different SPF for different parts of the body, for sensitive skin, or while swimming, there are many options available. Hats. Even if you're not usually a hat person, you can probably find a hat that would work for you and give you some sun protection. As a bonus, hats can help cut down on glare and spare your eyes from getting too much sun. Face creams or makeup. Many moisturizers or foundations have a built-in protection, usually an SPF between 15 and 25. Using both a moisturizer and a foundation with an SPF doesn't mean they add up, so choosing just one product with an SPF is fine. Clothing. There are many types of clothing available that have an SPF built into them. Regular clothing only offers an SPF of about 5, while specialized clothing can be as high as 50. This is especially helpful in covering the back and neck, which can be tricky to get to with a cream sunscreen. Umbrellas. Don't laugh! Using an umbrella to create some shade is a really smart idea, especially while at the beach or pool. If you consider the potential for serious skin problems and what they could cost in money and in quality of life, the cost of purchasing or renting an umbrella is a steal. Staying inside. Stay inside during peak UV hours. This might vary, but by and large, staying out of the sun or using good sun protection between the hours of 11 AM and 2 PM is a good idea. Checking a weather app for the UV index is also really helpful in understanding how much exposure could occur on any one particular day or at a particular time. But Don&apos;t I Need The Sun for Vitamin D? It's true that we need vitamin D and that the "sunshine vitamin" is created when your skin is exposed to sunlight. It's also known that people with IBD tend to have lower amounts of vitamin D than people who don't have IBD. The good news is that vitamin D can be gotten through supplements and food, and your doctor can advise you on how much vitamin D you might need. Exposing skin to sun on a regular basis, and especially burning, is associated with an increased risk of skin cancer, so it's important that people with IBD not get too much sun. The Centers for Disease Control and Prevention (CDC) state, very clearly, that "indoor tanning can cause skin cancers including melanoma (the deadliest type of skin cancer), basal cell carcinoma, and squamous cell carcinoma." There are many myths about tanning beds, including the idea that they are safer than sun exposure, that they're useful for getting vitamin D, and that getting a "base tan" is a good idea. There is no benefit to tanning beds, and people who use them, even just once, are at a greater risk for developing skin cancer. Vitamin D is important to our bodies, but it can be gotten through food and supplements, and not just from the sun. Some sun exposure is part of living life and getting beneficial time outside, but people with IBD need to limit their UV exposure. Certain medications may put people with IBD at greater risk of developing skin cancer. However, there are many ways to limit sun exposure including sunscreen, protective clothing, and using shade. It's important not to be fearful of developing skin cancer, and to know that some of the risk is directly under a person's control. Centers for Disease Control and Prevention. "Indoor Tanning Is Not Safe." CDC.gov. 5 Jan 2016. Long MD, Martin CF, Pipkin CA, et al. "Risk of melanoma and nonmelanoma skin cancer among patients with inflammatory bowel disease." Gastroenterology. 2012 Aug;143(2):390-399.e1. Okafor PN, Stallwood CG, Nguyen L, et al. "Cost-effectiveness of nonmelanoma skin cancer screening in Crohn's disease patients." Inflamm Bowel Dis. 2013 Dec;19:2787-2795. Singh S, Nagpal SJ, Murad MH, et al. "Inflammatory bowel disease is associated with an increased risk of melanoma: a systematic review and meta-analysis." Clin Gastroenterol Hepatol. 2014 Feb;12:210-218. Yadav S, Singh S, Harmsen WS, et al. "Effect of Medications on Risk of Cancer in Patients With Inflammatory Bowel Diseases: A Population-Based Cohort Study from Olmsted County, Minnesota." Mayo Clin Proc. 2015 Jun;90(6):738-746.